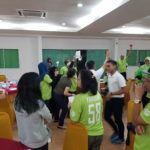 A program based on the book by Patrick Lencioni ‘5 Dysfunction of a Team’. 1.To create synergy among team member. 3.To instill the positive work attitude and spirit of achievement towards performance excellence.